Harley Davidson Boxed Coaster Set come in sets of four and designs to suit all motorcycle fans. Life Doesn’t Come With a Road Map Tin Sign is an exciting addition to an office or any other room. This sign is a reminder of the open road and all its possibilities. Dad’s Remote Novelty Gift is a gift for the goofy Dad who never gets control of the remote. This remote control provides commentary that speaks to his love of the sports, food and family, which will also make him laugh. Diners, Drive-Ins and Dives a book by Guy Fieri take readers on a culinary tour. There are recipes, anecdotes, history and more in this soft cover book. 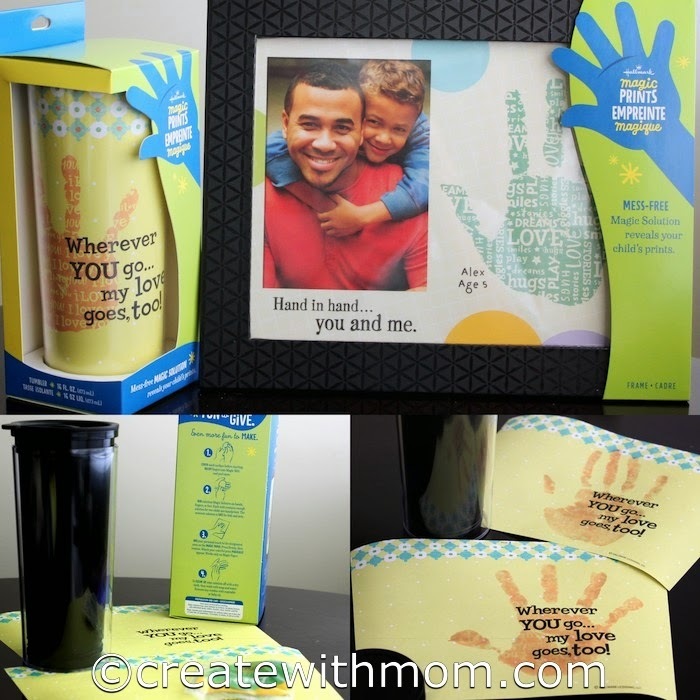 Love Goes Too Hot and Cold Travel Tumbler allows us to display our children’s handprint. Other gifts include, Autograph Baseballs, Perpetual Calendar, Frames, and Mugs. Darth Vader Cut-out Desk top sentiment is another wonderful décor to desks, shelves and tables. Star Wars character bottle opener with sound is a cool gift for Star Wars fans. Hallmark also has meaningful gifts to give graduates, whether graduating from kindergarten or university these gifts allows us to show how proud we are of their accomplishment. Autograph Owl with Pen is a fabric owl where family, friends and fellow students can add meaningful messages. This owl can be passed around during the graduation party or open house to let everyone add a signature, well wishes and special memories the grad will enjoy reading after the festivities are over. One-of-a-kind Creations 2014 Frame will be awesome to remember the momentous occasion with a one-of-a-kind customizable "2014" die-cut frame. Sculpted Sentiments commemorates the milestone with a sophisticated white porcelain sculpture of a lock that says, "Unlock your potential". The other sculptures such as a graduation cap, typewriter, airplane, and light bulb are meaningful pieces of decor that will look good on a bookshelf, desk or bedside table. Accordion Display Board Album is a perfect addition to a coffee table or a room as it allows us to feature favourite photos; it includes a sticker page for customization. 2014 Graduation Album, which will help preserve the memories captured. The album has 50 photo sleeve pages, with lines for journaling to record and remember the moments for years to come. The Owl Gift Card Holder, 2014 Red Party Mug are other wonderful gifts that can be given to graduates. For Wizard of Oz fans there are water globes, perpetual calendar, and musical figurines. If you are in Canada and would like to win your own Autograph Owl with Pen then enter the giveaway through the rafflecopter below before July 20. Please follow my social media networks and leave comments to be eligible to win. I always head to Hallmark when I have something special to purchase for a specific occassion! The Darth Vader bottle opener is great! Hallmark is such a great brand, I love their greeting cards, they are so meaningful. Hallmark always has wonderful gifts, for all occasions. I love the Graduation Owl...so cute. I like the Graduation Owl....so cute. Hallmark is a gorgeous store, love the specialty cards they carry! My youngest is graduating from Gr. 12 at LCCVI in Petrolia Ont. She LOVES owls and she would love to get this as a gift. She is going to attend University of Windsor in the fall to get her C.P.A. I live in BC and if I won, I would give the Owl to my niece who is graduating. I live in NB and the owl would be for me! I live in Ottawa ON and would keep this allll for myself! I live in Toronto, ON. My sister is graduating in a week or so. I will give it to her. I live in Toronto and I would give this to my daughter. I live in BC and I would give it to my niece! I live in NW Ontario, and I would give this to my son. I live in Ontario and I would gift this to my daughter! I live in Ontario and i'd give it to my niece. Ontario and I WANT IT! I'm in BC. I'd give this to my niece. I'm in BC and I would give it to my son to collect his friends autographs at the end of the year. I live in Ontario and would give this to my daughter. I live in Saskatchewan and I would give it to my daughter. I live in BC and I would give this to my son. I live in Ontario and I would give it to the next niece/nephew to graduate...I have so many!! I think the next one will be my niece Sierra.